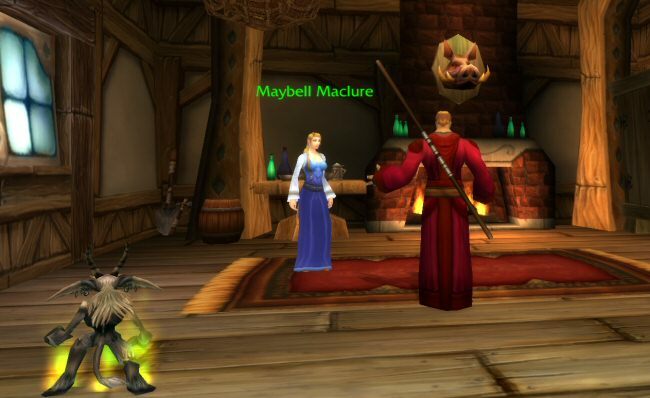 Then we have to make the trip from Goldshire to the MacLure farm, which means a ten-minute running battle against thieves, bears, cutthroats, and giant spiders, who are apparently somehow all in league with each other and want to kill us on sight. "What does it say when thieves live in more harmony with nature than you?" "Just stop it!" Norman snaps. "You're always trying to make it sound like I'm evil. I'm not." "I'm not saying that. I'm just showing you that good is just evil with better P.R. Why is it okay to kill that robber? Because he's evil. Why is it wrong to kill that lazy town guard? Because he's good. What makes the robbers evil? They attack good people and take their stuff. What makes you good? You attack evil things and take their stuff. These are your rules, not mine." "There's no comparison! You said so yourself that you demons want to wipe out the mortal realms!" "True, true. But what about your mom?" Norman turns red with fury, "Be very careful what you say about my mother, demon!" "Fine. I'll let you say it yourself. What if she suddenly got the power to wipe out the demon realms?" Norman begins chewing on his mustache furiously. "Anyway. I'll let you sort that one out for yourself. Let's get this potion delivered." Norman marches in the door, hands over the potion, and walks back out. Maybell mews some thanks before she chugs it and disappears. "Was she under house arrest? Was that really the only way she could escape her own farm?" I ask. "I don't care," Norman says. "Well, you didn't save anyone, you didn't protect the lands, and you didn't defeat the forces of evil. But you did help a couple of clueless unwed teens get it on, so that's something." As we enter town, our old friend Remy stops Norman and begins to ask for help. "Not interested!" Norman snaps. "I'm here to help save people from evil and I don't care about feuds or lovebirds or gold dust or any of the other nonsense you people have been yattering about." 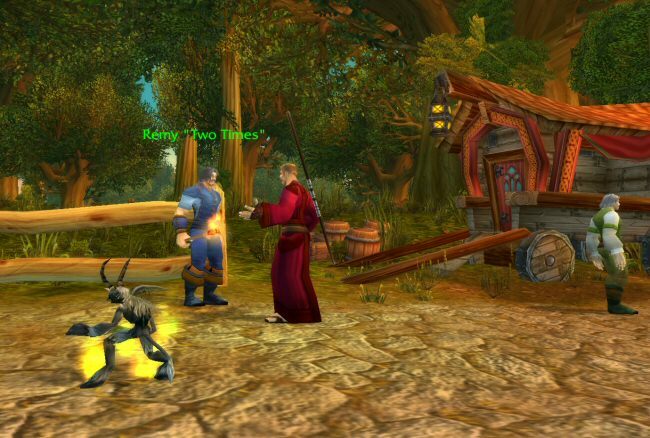 But Remy persists, "There's a new threat in Elwynn Forest! Murlocs are swimming up the streams of eastern Elwynn, scaring away fish and attacking gentle folk! I warned Marshal Dughan, but he's more worried about the gnolls and the bandits. He's not convinced that the Murlocs are a danger. Please, speak to Dughan and persuade him to send more troops to the east!" "Murlocs attacking gentle folk?" Norman nods. "Now that's a job!" 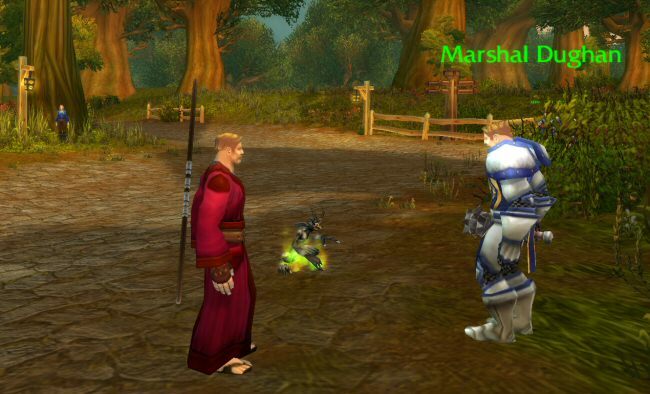 Norman strides over to Marshal Dughan and gives him the skinny on the Murloc problem. Dughan stares off into space while Norman talks. A little yawn escapes him. Finally he replies with a well-rehearsed answer, "Yes, I spoke with Remy. 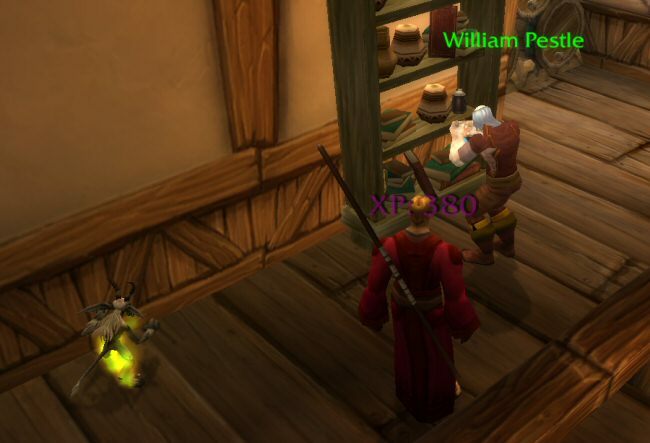 I respect him as a merchant, though all reports of Murlocs to the east have been sketchy at best." "Sketchy? Have you tried talking to the candle guy at the inn? He never leaves the building, and even he knows about the Murlocs! I fought a dozen of them just an hour ago! " Norman protests. "Your concerns are noted, but unless I receive a military report of a Murloc threat, we can't afford to send more troops east. If you are concerned that the rumors of Murlocs are true, then do this - travel to the eastern Elwynn bridge and speak with Guard Thomas." "Are you offering to hire me to talk to your own men for you?" Norman says slowly. Next week: Go east, young man. Go east.